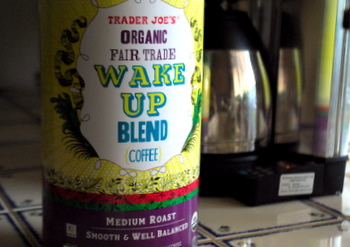 The huge logo on Trader Joe’s Wake Up Blend Coffee pulled me in – I was shopping early and who couldn’t use a little pick-me-up before noon? – as did the jumbo-sized can that the beans came in. This is twice the size of TJ’s standard coffee containers, which makes it a convenient option if you go through a lot of coffee in a short time (brewing multiple pots per day for a family or a small office, for instance). I anticipated that this coffee would be fairly mild and acidic, as many”breakfast” coffees are, even though it was a medium roast. While it was quite acidic, it had a fairly full bodied flavor. It was much better when brewed a little on the strong side, so that the flavor of the coffee could temper some of the slightly aggressive acidity. Once you get past the first few sips, more flavors seem to emerge and the coffee takes on a pleasantly nutty taste, reminiscent of hazelnuts with maybe a hint of nutmeg to it. It took a little more experimentation with the coffee-to-water ratio than I usually need to do to accommodate a new blend, so keep that in mind if you brew this and it doesn’t come out to your tastes the first time around.